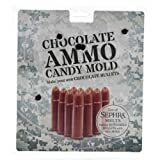 No matter whether you enjoy hunting, shooting, are in the military, or just have a sweet tooth that's always locked and loaded, then bite the bullet and pick up a can of these cool new Chocolate Bullets. 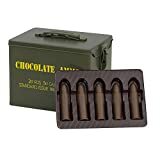 Yep, inside this miniature metal ammo tin are twenty standard issue .50 caliber bullets made from safe yet decadent milk chocolate that is handmade here in the USA. 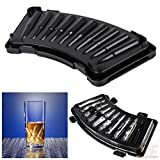 The ammunition can is made from real metal and is stackable and lockable as well, just don't store it next to your real ammo and get it all mixed up.